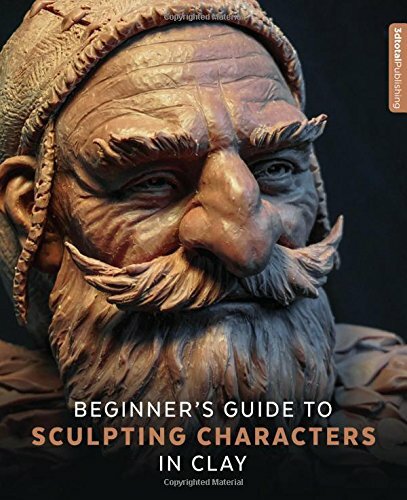 Not that I've seen many books on sculpting, but this is a terrific and almost exhaustive guide to sculpting that I think any beginners should get their hands on. The book's probably targeted at people who are into creating concept art and characters. Concepts and techniques taught can be applied to any subjects that can be sculpted though. The book starts off with an introduction to the different types of materials and tools available. There are detailed explanations, almost 40 pages total, of the pros and cons of various brands of clay and sculpting equipment. After the introduction on tools, there's a short section on understanding anatomy and how to use that knowledge for sculpting. The highlight of the book is definitely the detailed step by step guided tutorials. There are 5 tutorials in all. You'll get to learn how to sculpt a space cadet, mermaid, dwarf, cyborg and ocean emperor. Each tutorial is created by a different artist, namely Alexander Ray, Jennifer Hendrich, Glauco Longhi, Alfred Paredes and Romain Van Den Bogaert. Other contributors are Sean Kyle, Djordje Nagulov and The Shiflett Brothers. Each tutorial is broken up to around 70-80 steps. The pictures are properly arranged, and explanations are concise and clear. That's the level of detail you can expect. This 256-page book is just packed with insight. The example sculpts look absolutely wonderful. They may even look daunting to beginners. But it's really cool to have such skilled artists to come together to share their knowledge in a book like this. This is a great book for any beginner sculptors.